Alarm.com is the leader in Smart Home Security, giving you solutions to monitor, protect and automate your home. More than a smart App or cool thermostat, Alarm.com seamlessly connects the key devices in your home on one platform- so they can work together, and work smarter. 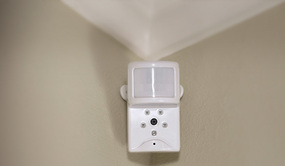 Alarm.com's wireless image sensor takes a picture when motion is detected and sends it to you-day or night. Customize your rules to receive image alerts for any activity you care about- see who disarmed the system, or what's happening in an alarm event.